The Craftsman trademark was first registered by Sears in 1927. It came about when Sears’ hardware department head bought the rights to the name from Marion-Craftsman Tool Company. The aim was for Sears to continue manufacturing and selling tools, lawn and garden equipment and workwear under the Craftsman brand. The tools themselves are not made by Sears, but by several other companies under contract. In 2017 Stanley Black & Decker purchased the Craftsman brand from Sears. However, Sears can still manufacture and sell tools under the Craftsman name for the next 15 years. The Craftsman brand is a known and trusted brand that’s top rated in the market. The Craftsman chainsaw line extends to almost 20 models – all of which cater to a variety of people in the market from the same manufacturer. From rear handle to top handle, gas powered to electric powered; there are so many affordable options on the market. The models for sale include some of the best Craftsman chainsaws for the money. The sheer level of variety also ensures that whatever your needs are, they are sure to be met by Craftsman. This includes homeowners, professionals, and those in need of commercial grade saws. The 42cc engine is very powerful. It has an Incredi-Pull™ system which enables easier starting. It has an anti-vibration handle to reduce user fatigue. It comes with a carrier case as part of the package. It has a competitive price tag. It uses a lot of fuel. QWhat kind of fuel does it use? The Craftsman 16 inch petrol powered saw has proved to the market that good chainsaws can cost less. This 42cc power horse can cut through any type of wood with ease, and does it effortlessly. It has anti-vibration and easy start features to make the user more comfortable, and the wrap-around handle gives better grip. It’s a little on the heavier side but this is a small negative. Clearly this chainsaw is one of the best Craftsman chainsaws for the money. Check out what other people who purchased this product think about it. 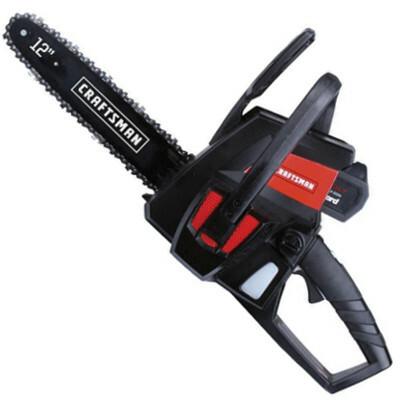 Read Craftsman 16 inch gas chainsaw reviews. It manages small and big jobs quite easily in comparison to other electric saws with similar specs. Some components are not well built. Being corded limits its reach. It needs a heavy duty extension cord. QWhat kind of replacement chain can be used with it? QWhat power output is the motor? When it comes to finding an electric chainsaw that does what a petrol powered chainsaw does, it can be tough. 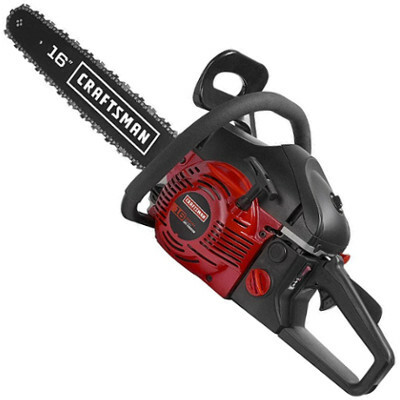 However, this Craftsman 18 inch electric chainsaw has all the power of a gas powered chainsaw without the need for maintenance. It cuts through any wood and is perfect for those light chores around home. It’s not a professional or commercial grade saw but it fits into the homeowner market nicely. Check out what other people who purchased this product think about it. 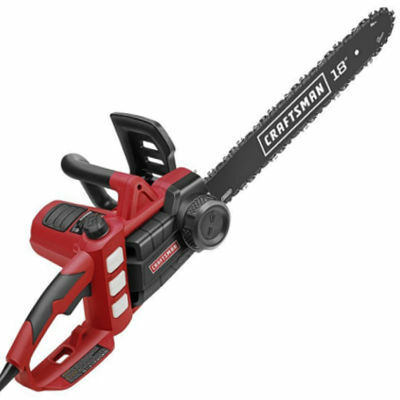 Read Craftsman 18 inch electric chainsaw reviews. There’s no fuel hassles as it’s electric. The battery life is quite good. It’s quite powerful for being electric. You are limited in where you can take it as it needs a power source to charge the battery. It has a small chain which limits its cutting ability. Craftsman electric powered cordless chainsaw. QHow many batteries does it come with? A1 and a half hours. ALow kickback Oregon bar and chain. If you’re looking for a power tool to trim and prune around home, this Craftsman cordless battery chainsaw is a good option. It’s light, fast at cutting and holds good battery power. Almost anyone can operate it and it has great safety features to keep you safe while on the job. This is undoubtedly one of the best Craftsman chainsaws for the money. Check out what other people who purchased this product think about it. Read Craftsman 12 inch cordless electric chainsaw reviews. It can be used as a pole chainsaw, or as a standard chainsaw. It has a powerful 9 amp electric motor. The telescoping pole has a 10 foot reach. It has a quality Oregon bar and chain. The cord limits its reach as both a chainsaw and an electric pole chainsaw. It’s limited in its use to light trimming. It can only be used for home maintenance. Craftsman electric powered pole chainsaw. For the homeowner who can’t quite reach the heights needed to trim and prune, this Craftsman electric pole chainsaw is the answer. It’s lightweight, has a 10 foot reach (including the chainsaw itself) and can easily be used off the pole as well. It cuts through many small trees, and is very low maintenance. It’s one of the top rated pole chainsaws on the market, and can be purchased both online and through Sears. For the cost, you also get a lot of bang for your buck, making it one of the best deals Craftsman has to offer as well. Check out what other people who purchased this product think about it. 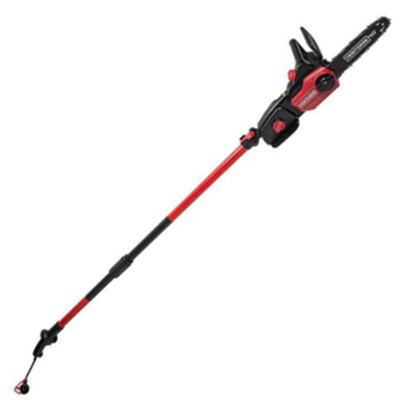 Read Craftsman electric pole chainsaw reviews. Craftsman chainsaws fell under the Sears umbrella until recently when it was bought by Stanley Black & Decker. However, different chainsaw companies such as Poulan are sourced to make Craftsman chainsaws. A consumer must refer to the chainsaw’s item or model number to find which company made each product. This list can be found here. Where are Craftsman chainsaws made? As per the list above, Craftsman chainsaws can be made in any number of countries around the world. A consumer must match the item’s model number to accurately find out where their particular product was produced. Where do you buy Craftsman chainsaws? You can buy Craftsman chainsaws from Sears, Kmart, Amazon and some online stores. The best deal can most certainly be found online.